﻿Published by Sareth Ney on Oct. 26, 2016 at 4:57 p.m.
Kattan was born in Sherman Oaks, Calif. After he graduated from high school, he moved to Los Angeles. While residing there—he became involved with the improv/sketch comedy group, The Groundlings. After moving to New York, he became a featured player on “Saturday Night Live” in March of 1996. In Sept. of 1996, he became a cast member and remained on the show until May of 2003. Since then, he moved back to Los Angeles. As an actor, Kattan co-starred in the following films: “A Night at the Roxbury”, “House on Haunted Hill”, “Monkeybone”, “Cork Romano”, “Undercover Brother”, “Adam & Steve”, heard in “Aqua Teen Hunger Force Colon Movie Film for Theaters”, “ImagiGARY”, “The Last Film Festival” and more. In television, he could be seen in: “Saturday Night Live”, “The Middle”, “How I Met Your Mother” and more. 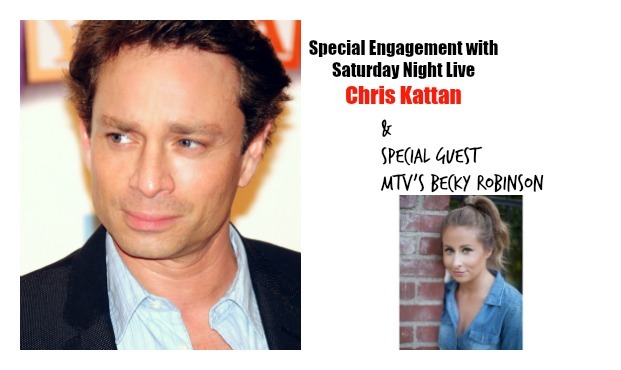 Future projects for Kattan include: “Breaking Legs”, “How To Get Girls” and “The Bobby Roberts Porject”. Portland, Ore.’s Robinson began her comedy career, while she attended San Diego State University. While attending college, she performed at the La Jolla Comedy Store and The National Comedy Theatre of San Diego. After obtaining her degree and appearing on TedxTalks SDSU—she moved to Los Angeles and continued with her crafts, as a comedian. In 2015, Robinson assisted with the production of Comedy Central’s “Not Safe with Nikki Glaser”. Then, she was casted in the lead role on Oxygen’s “Straight Up with a Twist”. Her first Funny or Die project was playing opposite of Johnny Depp in the film, “Art of the Deal”. More viral videos continued to follow including “McDonald’s Proposal Fail” and continues to produce for Funny or Die. Robinson provided voiceover work for “Court Ordered”. She followed up with Fox’s “Laughs”, NuvoTV’s “Cabo Comedy Festival Fresh Faces” MTV’s “Acting Out” and “Wild ‘N Out”. She has an alter-ego, Lil Pickles. Tickets to Kattan and Robinson’s performances range from $22 (VIP front row, VIP seats and General seats) to $32 (best seats) and the prices exclude taxes. The content and language for all five show are rated R. For more information about the events, please visit Comedy Club of Jacksonville’s website by clicking here.